I keep in touch with my best friend from high school. She still lives in the same town where we grew up, and I've moved all over the place. We used to write each other, back in college and shortly thereafter, but now email is her medium. She keeps me up to date with regular email and photos of her awesome daughters. I recently started writing to her oldest daughter, who is now 6 years old and a really bright kid. (Yes, I'm biased. But her kids are all great, really.) Annalise has become one of my best pen pals - she writes to me almost every week. She is clearly into it, and I've encouraged her with multiple gifts of cards and stationery, and of course I enclose stickers and fun pens and such. I recall that I got into writing at a similar age, urged on by stationery and pen gifts from one of my mom's friends (who is also, coincidentally, child-free). Annalise is the oldest of three girls; Scarlett just turned 4 and Noelle is a little under 2. Apparently Scarlett was getting jealous of Annalise's mail from me (of course I decorate it and make it pretty darn cute, if I do say so myself), and recently she started crying when one of my letters arrived for Annalise, because she felt left out. 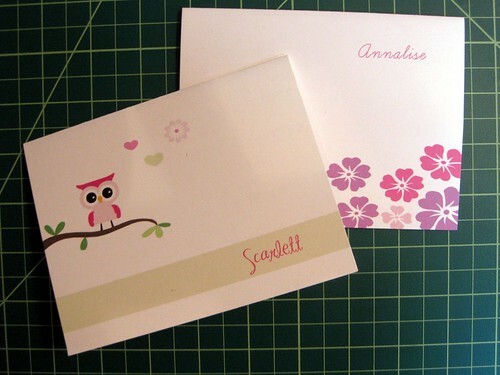 So big sister Annalise saved the day, and told Scarlett to pick any of the cards I had sent to use for letter-writing, and Annalise would write down the letter that Scarlett dictated to me. So now I write to both Annalise and Scarlett. 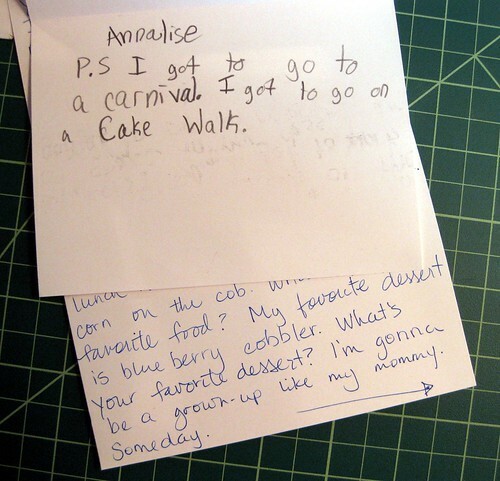 Annalise writes her own letters, and has recently even started addressing the envelopes herself; Scarlett's letters are dictated either to Annalise or to her mom, but she signs her name herself. Needless to say, their letters make my day; recognizing how long a wait of 5 or 6 days for a letter may be to a tot that wee, I make a point of writing them back immediately. It doesn't take long to write a bite-sized letter to a child, and they always write me back within a week. It just warms my heart to have brought such young letter-writers into the fold, and to have an opportunity to get to know these little girls who I'd otherwise only see once a year or so. And their mom tells me that it's great writing practice for them; certainly I can see the improvement in Annalise's handwriting as she goes along. And of course I have a lot of fun finding cute stationery to encourage them! I've given them the Sukie Animals on Parade notecard set, Masha and Friends: 15 Matryoshka Notecards, and most recently, personalized stationery from Owl and Branch notecard set and Hibiscus personalized notecard set from JoseJeanDesign on etsy (shown in photo above). My favorite line from a recent letter is from Scarlett, dictated to her mom: "I'm gonna be a grown-up like my mommy someday." So sweet that they're so young and already interested in letter-writing! This has to be my absolute favorite post of yours. It really gives a sense of the kind of heart you have, and it also shows how sweet and precious children are. Thank you for giving a glimpse into your personal life. That's adorable. What a great way to stay in touch with them, too, and encourage them to keep in touch with people they don't necessarily see every day. It's a good lesson to learn early in life - after all, I know waaay too many people who are terrible at keeping in touch... myself included, really. So go you! And go them for getting excited about letters! I also try to write my friends boys. They are 5 and 3. It's a new thing, so we'll see how it goes. This is wonderful. They will actually grow up knowing how to write letters. Even just that little section about the carnival and the cake walk made my day. When you read something like that it makes you realize that the great things in life are those little things. Oh that is so precious! I keep trying to get my 14 yr old sister interested, but she seems to only the receiving mail part. I'll keep trying with her though! This is lovely -- how wonderful to share the excitement of a letters arriving "just for you "for the girls. The excitement of a happy mailbox. I am so envious! I hope their interest continues. I tried to help inspire a 10 year old who was excited to receive a reply from her favourite author after writing a fan letter -- but the look on her face after she opened up my gift of a personalized address stamp, postage stamps, and stationery -- well, I immediately realized that sometimes it's better to receive a robotic "ThankYouVeryMuchForTheBirthdayPresent" over the phone than to witness up close what a well-intentioned, but completely unwelcome gift can do to a little girl's face. All that to say: I'm really happy for you to have such dedicated pen pals (okay, and still jealous that you get responses....! Your post is just bursting with extreme cuteness! I remember when I was little, I was a bit jealous when my big sister was using her typewriter ... one time she was very nice and let me dictate a poem for her to type. (It was something silly about birds.) She made it very pretty with a border all around it of ~~~ and ***.